This was first published on the RJI blog. I spent last year at RJI studying audience engagement — reading, talking, interviewing, writing, more reading — and ended that year motivated to put what I’d learned into practice. Luckily, the job I came back to was in a newsroom built on experimentation, with colleagues willing to go along on the engagement ride. In August, we kicked off the Missourian’s community outreach team, made up of students in a class I teach called Participatory Journalism. (The class has existed for years and was developed by Clyde Bentley, also an RJI fellow.) This year, the focus of the class broadened to include more ways the relationship between journalists and their communities are changing. The underlying principle lies in a diagram created by Meg Pickard at The Guardian, which crystallized my goals. The team’s tasks are diverse. We started out with some specific goals, succeeded at some, failed at a few and adapted others. We made up a lot as we went along, and a spirit of experimentation and assessment guided us. I want to share some highlights from our first four months, and I’d welcome your ideas, feedback and questions. The low-tech option is often the right one. On three occasions we distilled coverage or resources into a one- or two-page handout and took it out into the community. The underlying goal here was to identify who would most want and need some information and then to take the content directly to them, rather than hope they found it on their own. — 9/11 parent resource: Our team reported a story about how to talk to kids about 9/11 with the intention of distributing hard copies. We got permission from after-school programs, daycare centers and the public library, and showed up at soccer picture day and some coffee shops. In all, we distributed 800 handouts. Parents and proprietors were surprised in some cases, but almost universally enthusiastic and grateful for the resource. — City Council budget talks: With a reporter and editor, we distilled a week’s worth of coverage to a potentially contentious (and definitely well-attended) budget meeting. Our goal was to put facts in the hands of people who were having emotionally responses to controversial proposed changes. We took 100 copies, ran out and had people asking for more. — School redistricting: When proposals were announced for new public school boundaries, we summarized the key points and key coverage, then took about 600 copies combined to several elementary schools to hand out as kids were picked up. INVESTMENT: It cost roughly $30 to print these three batches combined (0.02 cents per page times 1,500 pages). Also, 8-15 hours each (of my time and combined student time) in repackaging and distribution. ANALYSIS: Success can be partially measured in community reactions and awareness. People were surprised we went to the effort, pleased to have the information and, in some cases, helping us distribute further. Especially for 9/11, it’s safe to assume that of those 800 copies, at least half actually (conservatively) made it into the hands of people who would both find the information useful and be otherwise unlikely to find our content. That’s outreach. The external benefits in this case are extended reach, community awareness and community goodwill. The internal benefit is an awareness of this delivery method as a valid option for information sharing. 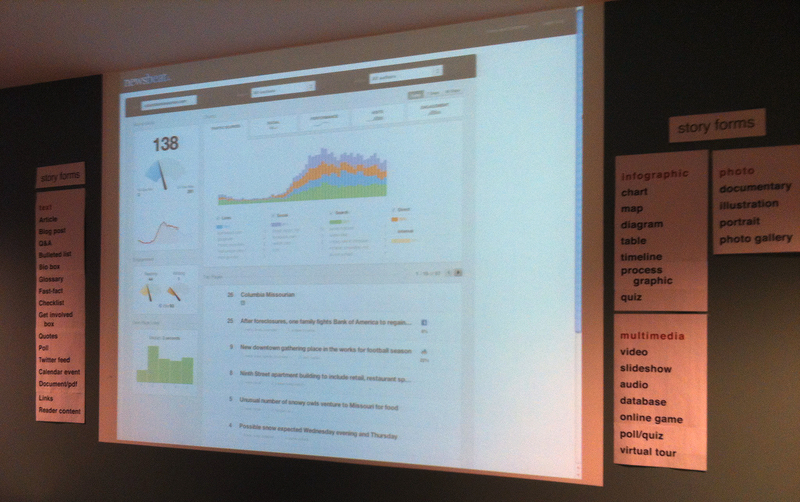 Real-time analytics from Chartbeat; projected on the wall of the Columbia Missourian newsroom. We began producing two analytics reports, one for overall traffic and one for local traffic. That represents a big step toward more sophisticated analytics reporting. Some highlights of what we learned can be found in this presentation. We began tracking the effect of social media on traffic. We also started using Chartbeat, a sophisticated real-time analytics service. We project real-time data on the wall of the newsroom, and that has raised the general awareness of the room. INVESTMENT: Four hours a week by one outreach team member preparing the weekly report, and another four spent by another team member on longer term analysis. ANALYSIS: Based on our use of google analytics, we know more than we did about our audience, and specifically our local audience. We are working more closely with the business side to help them understand who we serve. We have at times used the analytics to make decisions about what information users are looking for and adjust our coverage based on it. Big steps will come next, to get more sophisticated about our analytics reporting and more strategic about what we do with the information. We had a goal of making our Facebook and Twitter accounts more consistent, more social, more conversational, more productive (in terms of referrals), more responsive to users, and more useful to the newsroom. We also wanted to reflect back to the community what people are saying about the things we cover. — We’ve used Storify to reflect what regular people are saying about news topics (such as the first snowfall and a new UM System president and #freetotweet day) and also for weekly peeks into football players’ tweets, and several of those files have showed up on the site’s most-read lists. Those files are reflections of the nature of social media, reflecting what people are saying, not just distributing links. — We’ve created several Twitter lists (including one for MU football folks and one for media in SEC towns) that could be a valuable resource. Unfortunately, we’ve done a poor job publicizing them. 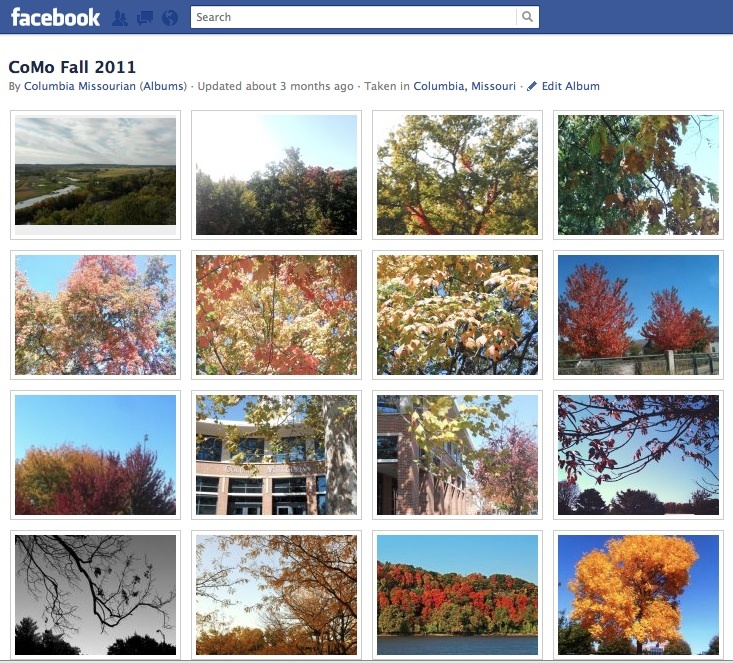 A crowdsourced Facebook photo album of staff and reader photos of Columbia in the fall. — We’ve had a few successful collaborative efforts, the most awesome of which is the CoMo Fall Facebook photo album, which generated more contributions and interaction than anything else we tried. INVESTMENT: Significant. There’s no way to quantify the hours spent between my team and the Interactive Copy Editing desk on social media this semester. It would be the equivalent of a part-time employee, probably. ANALYSIS: Referral traffic is way up. Traffic from Twitter grew 104 percent between August and December. We responded to most of the comments and @ replies to us that merited responses, though we still have much growth to do in how we use social media to listen to what the community is talking about. Traffic is high to the stories we do that aggregate comments or reaction. Peeking behind the scenes of the newsroom. We’ve offered users glimpses of newsroom life and plans. We published three behind-the-scenes videos (about a murder trial, the football press box, and changes in newspaper production) intended to personalize some individual people and be transparent and inviting about newspapering. We also looked for ways to share what we were working on ahead of time, including posting a picture of a white board of brainstormed story topics and asking for questions or input about stories in progress. INVESTMENT: The three videos was produced by the outreach team and did not take more time than other video stories. The sharing of our process on social media did not take significant time. ANALYSIS: We had more clicks than we expected on the picture we tweeted from a brainstorming session. Traffic was in the high triple digits for each of the behind-the-scenes videos, and time on page indicated that people watched the whole videos. Updating how we handle comment moderation and participation. We set out to assess our online comments, to make them more constructive and to increase newsroom involvement in them. We did a review of media comment policies and examined our own. We were responsive to comments ourselves. We instituted a new method for banning spam and moderating problem users. We also published a questionnaire, online and in print, and asked the community for input about civility and appropriateness. Afterward, we prepared a tweak to our public policy and, more significantly, a guide for the newsroom staff for participating in and moderating comments. The newsroom has indicated willingness and interest in being more active responding, fact-checking and perhaps guiding online conversations. INVESTMENT: Significant time on the part of the outreach team. ANALYSIS: This work involved a lot of collaboration with users. It also has the potential to lead to big changes in our newsroom’s communication with its audience. I’m really excited for the potential here. We will also begin tracking staff comments as part of our analytics reporting. Perhaps the least tangible but most important change has come in the way our engagement philosophies have been adopted by the newsroom. Our work has been generally embraced. Editors can be overheard asking who the audience for a story is, curiosity about analytics abounds, individual reporters are availing themselves of outreach team services and the culture of the newsroom is shifting more and more toward acceptance of audience-focused principles. I’ve said all along that my ultimate goal is for the community outreach team to work ourselves out of a job because the newsroom has so embraced our philosophies. We have a long way to go, but progress has been made. USER CONTENT: We created a byline for the Missourian Reader Community, and it’s a fun way to track when content has been created entirely by or significantly contributed to by readers. We also are in the beginning stages of a big change: Beginning to publish stories from readers on ColumbiaMissourian.com rather than on MyMissourian.com, a citizen journalism website developed by Clyde Bentley in 2004. We think highlighting stories from readers alongside our own stories will both draw more attention to the user content and make our own report more complete. Stay tuned. PHOTO ARCHIVES: The CoMo in Retrospect Facebook album has looked for timely and interesting ways to offer a glimpse into Columbia’s past. Two of the posts have led to “where are they now” stories. MEDIA DIRECTORY: The CoMo InfoHub is a directory of 80+ information sources, about Columbia or based in Columbia. It’s organized by topic, not by type of media, and lets people know where they can learn about parenting, food, sports, hobbies, business, etc., in and about Columbia. It’s nearing publication. COMMUNITY CONNECTIONS: We’ve developed a relationship with the journalism teacher at an alternative high school and have visited her class twice. She’s interested in bringing some of her students to the newsroom for shadow shifts, and she has called on me for advice and critiques as they restart their school newsletter. DEVLOPING INFORMATION RESOURCES: We’ve provided context-rich resources, such as this one on understanding the bond issue and this one on the Occupy movement. As the spring semester kicks off next week, I have some clear priorities in mind. OUTREACH BEATS. I’m going to attach my team members to reporting beats, so they can develop expertise and get involved in coverage earlier. They can also provide analytics feedback for specific topics, solicit community content on those topics, create social media listening strategies and participate in beat brainstorming. PUBLIC INSIGHT NETWORK. Our crowdsourcing efforts are about to go to a dramatically new level, as our partnership with the Public Insight Network gets off the ground. The system will roll out in our newsroom sometime this spring. BEING OUT IN PERSON MORE. My outreach team members will be assigned to go to more community events, to represent the Missourian, answer questions, solicit community content — and listen. In addition, we’re working on how our editors could be more visible and accessible. COMPARING ANALOG AND DIGITAL CONVERSATIONS. Say we want to ask the community to identify its priorities going into a municipal election. What if we did it on social media AND outside Walmart and at the public library? Wouldn’t it be interesting to see what kind of response we get — both in attitude and in content? Thanks for reading. I’d sure welcome your feedback on any of this. What do you predict will have the most impact? What do you wish we’d try and report back about? Get in touch anytime, at mayerj@missouri.edu, @mayerjoy on Twitter or 573-882-8182. Here’s an account from one of my awesome students, Shaina Cavazos, about her experirence on the fall community outreach team. Man, I have a cool job. Alicia, reader advisory boards aren’t a new concept for newspapers. I think if we’re going to ask people to give up an evening or a breakfast or something each month, we need to know exactly what we hope to accomplish and be able to genuinely tell people what we hope they’ll get out of it as well. I think the readers board is a fantastic idea. Why try and guess what our readers want when we can just, you know, ask them? I’m really excited to see how these new ideas come to life this semester.